The Eastern Conference Finals are starting today. I have studied the Indiana Pacers as if I were a member of the Miami Heat coaching staff. The data were taken from Synergy about two months ago, so some statistics may have varied a bit taking into account the bad results of the month previous to the playoffs. The project included video, but I cannot use it. This is my team scouting and the starting five individual report. Hoy cambiamos totalmente de rumbo. 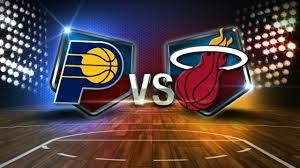 Empiezan las finales de conferencia entre Indiana Pacers y Miami Heat. En la última formación que he hecho, he analizado la posible eliminatoria con meses de antelación ya que eran los máximos favoritos. Los datos aportados a través de la plataforma de Synergy son de hace un par de meses, por lo que la última racha negativa de los Pacers y de algunos de sus jugadores todavía no había alcanzado su punto máximo. En el proyecto se incluían clips de vídeo, pero han quedado en la plataforma por cuestiones de derechos. El análisis consiste en ponerme en la piel de los Heat a la hora de preparar el playoff contra los Pacers. Hay un informe colectivo y otro del quinteto titular. I chose the Indiana Pacers for my Final Project as if I were a member of the Miami Heat coaching staff. As they are the main contenders to reach the Finals, I tried to breakdown the Pacers main strengths combined with “our” weaknesses on both ends of the court and the other way round in order to predict how they would try to take advantage of them and how we can exploit their weaknesses. I selected clips from the previous games whenever possible because I think if the players see images of themselves playing the Pacers, their attention will be better and it will be more practical. It seems clear that they look for a slow pace, trying to control the tempo and slow down the opponents’. Many of their shots are taken near the end of the possession, with excellent balance between crashing the boards with their big men and coming back on defensive transition with the perimeter players. These data are far from being impressive, but there are some specific plays which they can use against us. I chose 3 aspects in which I believe they can take advantage of, because they are good at them and we aren’t playing good defense. 1. Post-Up: they play post-up situations 14.3% of the time, which is much higher than us (7.8%) and the higher percentage in the League. Our defense in Post-Up situations in one of our biggest weaknesses since we are allowing 0.931 PPP (#28 in the League). They average 0.857 PPP. They will likely pound the game inside. They use a decoy top Pick&Roll to feed Hibbert inside against Bosh, who is unable to anticipate and allows a deep catch by Hibbert. The pass is hit from the corner. If Hibbert catches the ball with both feet in the paint, nothing else can be done. In addition, take into account the fact that he turns left shoulder, his favorite and most effective back to the basket move. The Pacers run a long set with a Pick&Roll on top, playing against our show Pick&Roll defense, but the objective is to play a double option for Hibbert inside: the first is a High-Low play when Hibbert ducks in and flashes middle. If X5 denies, the ball is reversed to the opposite wing, who feeds inside for the ISO 1on1. 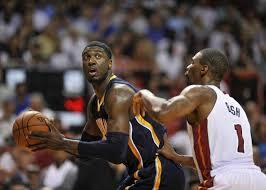 Again, Hibbert will likely turn left shoulder. We will need to deny the passing angles better to avoid this triangle.I chose these three options which they have in common to play inside after our defense shows in Pick&Roll defense. There are some other post-up situations detailed in the starting 5 scouting: West post-up situations on the right side for the jumper or on the left block for the hook (against Battier or James if we go small). Hibbert gets good positions in High-Low or after pin down screens. Hibbert is fed more often against us. We have to be ready to anticipate without the ball, deny passing angles and avoid deep catches. They run some Side Pick&Rolls as well. They know we would show, playing big-big against the defensive rotations. The weak side defender (Lebron many times) has to choose between rotating and helping on West or allowing George for an open corner 3. If weak side defender on the wing rotates, an extra pass can lead an easy look (Hill/ Watson most likely) Maybe we should adjust this Pick&Roll defense for the upcoming series, by being a bit more conservative, playing “Ice” in these Pick&Rolls, especially when Hibbert picks. I have chosen these three options which they have in common to play inside after our defense shows in Pick&Roll defense. There are some other post-up situations detailed in the starting 5 scouting: West post-up situations on the right side for the jumper or on the left block for the hook (against Battier or James if we go small). Hibbert gets good positions in High-Low or after pin down screens. Hibbert is fed more often against us. We have to be ready to anticipate without the ball, deny passing angles and avoid deep catches. 2. Pick&Roll (Pop) when West picks: this can be seen better in West’s scouting report, but West is their best picker on court (1.087 PPP when he is the roll man, Battier and James are allowing 1.026), both to play Side Pick&Roll or on top, where he usually pops out for the mid range jumper. We are the best Pick&Roll Ball Handler defense in the League (0.567 PPP), so we had better deny West and force the ball handler to finish the play. 3. 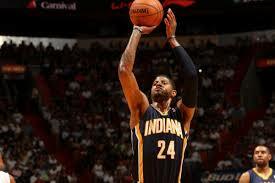 Off Ball Screens for Paul George: although we are a very good team defending off ball screens, Paul George is a real threat. Wade is great at this, allowing just 0.659 PPP, while George is scoring 1.115. Although the team plays several sets to free him coming off screens, we should pay attention to two which are most frequent: a pick the picker action and a pin down screen. we were late on our defense in previous games. He is also the go-to-guy in staggered and elevator screens. After looking into some of the plays which can harm us, I focused on things we do great defensively to reinforce them. 4. Pick&Roll Ball Handler: if we take a look at the stats, they should not play Pick&Roll a lot against us. As we see in Post-up situations, some of these Pick&Rolls are not aimed to get an open shot from them, but to open other options. We play great defense on top Pick&Rolls by going over the screen and dropping high by the X-screener. In picks oriented middle or baseline, the ball handler is forced to attempt a bad shot. 5. The 3 point line: the Pacers are 21st in PPP (1.044), and 52.1 aFG%. We are not good at defending the 3 point line, allowing 1.08 PPP and 53.7 aFG%.As a general rule, I think we have to disrupt their sets by denying some entry passes and forcing them go late on the shot clock. The worse is their shot selection, the more options we will have to play fast break, transition and speed up the game. We often lack rotation in weak side, so open shots are given up. We need to know when and how to help to collapse the paint and be able to prevent their best 3 point shots. Do not rotate if we are guarding George, avoid catch &shoot vs Hill and good close outs vs Stephenson and Turner. As a general rule, I think we have to disrupt their sets by denying some entry passes and forcing them go late on the shot clock. The worse is their shot selection, the more options we will have to play fast break, transition and speed up the game. We will be playing the best defense in the League, 0.864 PPP. They are great at transition defense (1.056) and in half court (0.825), allowing an outstanding 40.4% Score. 1. Transition defense: their shot selection and half court offense alignment permit them to be balanced once a shot is taken. The general rule is: the two big men go after the offensive rebound and the three perimeter players go back on defense. This is the most frequent, since they finish most of their plays with 3-out and 2-in. If a perimeter player drives, the power forward does not crash the boards, as he is usually on top of the key or around the elbow area. They play great defense by denying lay-ups while bigs recover. The two big men are sometimes behind the ball, but they are able to come back on time. The 3 perimeter players are ready to play defense and they can run fast break after forcing a bad shot. 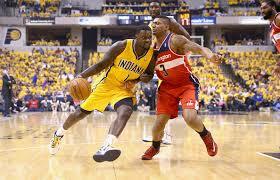 West is ready to come back on defense when Stephenson (George) drives to the basket. 2. 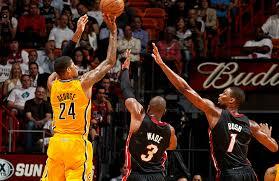 Defense around the basket: Hibbert’s impact on the game: Hibbert is their defensive key player, no doubt. He is always ready to help on dribble drives to the basket. He drops while Hill goes over to avoid shoot off the dribble and thus perimeter defenders can prevent catch&shots because they know Hibbert is protecting the rim. We will need good penetrations and kicks outs to get good looks and spread out the court as much as possible to have Hibbert in motion and reduce his helps. 3. 3 point line: they do a great job guarding the 3 point line, allowing a 41.4% of their shots beyond the arc and 1.006 PPP. Their Spot Up defense is also great (ranked 2nd, 0.903 PPP). Hibbert’s presence is again a key factor, defenders can be closer to their players and be ready to avoid easy catch&shoot looks even risking being attacked. 4. Transition: the battle is here, their excellent defensive transition versus our outstanding fast break. Every single bad shot they take, a fast break has to be scored. They are scored 1.056 PPP and we score 1.226 PPP. The difference is huge. How to win this battle? Every time outside players are out of position (rare), we have to push and score an easy lay-up. 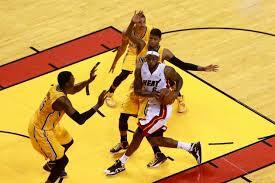 Every time Lebron grabs the defensive rebound and pushes the ball we have a great advantage. This is a great option for us. They have to stop him collapsing the middle and this opens the lanes. Knowing for sure they will collapse the paint, open 3s will be available. 5. 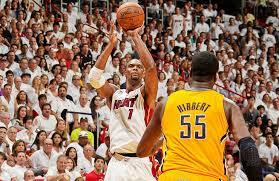 Pick&Pop Lebron- Bosh: we need to spread out the floor and draw Hibbert’s attention. If he wants to stay inside helping, he has to be punished with a jumper. 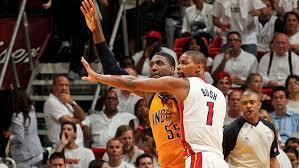 Bosh is key to stretch the floor and Lebron’s defender usually needs help not to be beaten. If they rotate on Bosh, he can assist the spot up shooters and we will have advantage to go after some offensive rebounds. The objective in offense is to make them think that they are the best defense in the NBA, but we are the best offensive team, so we are talented to beat them if we trust in our strengths and we can play our game. To do so, we have to improve our defense to get some easy baskets in fast breaks and transition game. As the Indiana Pacers starting five is concerned, I chose clips only on their offensive strenghts, because I would not be able to describe their weaknesses and defense in 7 minutes or less for all of them. The choices have been similar to the ones in the team scouting: I looked into the aspects of the game in which each player is good and aspects which can be dangerous for our defense. When I could, I selected clips from games against us, but it was more difficult than in the team scouting report. In order to be more complete, I searched for individual characteristics but within specific sets, to kill two birds with one stone. I would add another video with some weaknesses to exploit in both ends of the court. Pick&Roll Ball Handler: he plays Pick&Roll in 29.7% of his possessions, scoring 0.863 PPP. However, he cannot be considered the typical point guard using on ball screens all the time. In fact, he only plays 21.4% of the Pick&Roll plays his team runs, while George plays 35.5% and Stephenson 24.5%. Most of these screens are set as a kind of decoy or to take advantage of the defensive reaction, but Hill is not a very creative playmaker. His favorite move to finish is to drive middle for the runner or floater when his defender goes over the pick and the screener’s defender (West’s most of the times) does not help. He can go either right or left. In Side Pick&Rolls and in Middle ones he usually hits the roller, against a showing defense (a defense we often play) being responsible for reading the helps and passing to the open man, often for an open 3. He does not seem such a big threat to play show defense against him, by playing drop high, we could reduce spacing preventing him to start advantages for his teammates. Spot-Up: he is ranked “very good” thanks to scoring 1.082 PPP. In the sets he has two main spots from which to shoot. If defense gets involved in helps, he will be ready to knock it down with his feet set. He can also shoot if defense helps one pass away in the perimeter or in post-up plays. He can also shoot corner 3s to punish helps. Take this into account when rotations are needed. He is the go-to-guy and their best offensive player. He is such a complete player that it is difficult to reduce his game to a handful clips, but I chose the following features as the most dangerous for our kind of defense. Spot- Up: although he only shoots 11.4% of his plays off this play, I think that it is important to bear in mind his terrific efficiency (1.231 PPP and 60.1 aFG%). We usually give up many 3s, but the helps and rotations should be different in some sets in order to prevent his catch&shoot looks. They play 2on2 on one side to play against recoveries in the opposite. George is in baseline and he spreads out the floor for the open corner 3 when his defender gets involved in the defensive rotation. Never let him open. They try to take advantage with West in the block, we helped baseline in previous games and West skip passes for the open corner 3. If we keep on doing this, weak side defenders have to switch to avoid George’s shot and force him pass to the wing. Off Ball Screens: (16.1% of his plays; 1.106 PPP). Although our off ball screen defense is good, George excels in this, so we need to be focused on denying his shot coming off screens. In the clips we see two typical sets they run. A classical option in their transition offense: hand off on top and a cross screen for West. Then, George, in a pick the picker action is screened by Hibbert. They space the floor great in this set. They also look for a shot once the ball is inside. West catches and Hibbert pins down for George, who goes to the top after being back screened by Hibbert himself. He is good at coming off to his left and right. Other sets they use to free George are the elevator screens, the diamond (force him go wherever Hibbert is not the screener), staggered screens (1-5 with ball on 4) or screen the next man action when the ball is inside. ISOs: 13.1% of their possessions and 0.93 PPP. Wade can do great according to data, but I do not think he can guard him all game long. He finishes most quarters in top ISO (take into account for match ups and substitutions). He can take early shots in transitions (mostly left side as in clip 11) and he is better dribbling towards his left. Take care of his crossover right-left. Although he is their main Pick&Roll player, he is not so good at it. I think he is not so dangerous for us right now as he is in the former play types. Capable of the best but also of the worst, he is so unpredictable, but he can take advantage of some of our weaknesses in defense. Watch out some defensive match ups. ISOs: even though he only plays ISOs 11.8% of his plays, he scores 0.929, taking advantage of the attention George draws. Watch out match ups, rotations and bench players. James is only “average” at allowing 0.824 PPP and he is too physical for the guards or Allen. I chose a set which they can use against us: dribble hand off perimeter players to force switches and attack the worst 1on1 defender in top ISO. He can play against the mismatch after the switch in Side Pick&Roll. In both cases, and in general, he uses a lot of dribbles to either shoot a middle range jumper or finish at the rim if the defense is out of balance, weak or slow. Spot-Up: scores 1.138 PPP. He is able to knock down catch&shoot shots if defense helps one pass away (we often do so) and he is good at attacking close outs. Reduce spacing to recover on time. A hand to prevent him from shooting but most important, good stance and balance in close-outs to avoid being blown by his first step dribble. Pick&Roll Ball Handler: he runs a lot of plays of this kind for a player like him, but he is efficient, even though his decision making is doubtful. Take care of his explosive first step and cover the free side in our defense to prevent him from going away from pick. If we switch, he will often play 1on1 against the mismatch. Post-Up: he plays 30.1% of his possessions in Post-Up plays, and it is, no doubt, one of our greatest weaknesses. He scores 0.942 PPP. Bosh allows 0.949, Battier 1.023 and James 0.747. Andersen is good (0.741), but he will be guarding Hibbert. His favorite moves: he plays in the right block for the no dribble jumper after having read all the options available (difficult to double teaming here because he catches and faces up). He plays in the left block to turn left shoulder for the hook. He usually uses his hook when he is stronger than his defender and often takes two dribbles. Pick&Roll Roll Man (Pop in special): he is the main screener in most sets, but two spots are common. In Side Pick&Roll for the mid range open jumper with three players on weak side or top Pick&Roll with Hill with Hibbert in baseline and swing men in the corners He can pick and repick until the advantage is taken. I think we should force Hill to finish more of these plays instead of allowing West’s jumpers because in this alignment if we grab the defensive rebound, we can have a good fast break option. 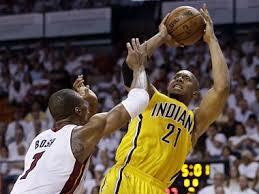 ISOs: within a set, he can play 1on1 when he catches on the elbow if he is quicker than his defender. This does not seem likely to happen against us, but we should not overplay the handoff and let him drive to the bucket. It is obvious that his bigger impact is in defense, but he can be a threat for our weak inside defense. Post- Up and Pick&Roll Roll Man: I join these two plays because most Pick&Roll he sets are to get the ball inside, back to the basket, not to finish directly. We need to keep him as far as the rim as possible. Avoiding deep catches with both feet in the paint is a must. Be aware of anticipating when he pins down. He is much better turning left shoulder in both blocks and when he flashes middle in high-low plays. A common set is one in which he pins down for West and he seals either his man or the switch. They run some Pick&Rolls, not to roll and finish, but to be fed inside vs the help which comes from weak side or against the recovery. When the picker pops out (West/ Scola) he flashes middle to receive deep in the paint and finish with no dribble. He can roll to the basket in top Pick&Rolls and finish at the rim. We need to be tougher and not late on recovering the ball handler.